For over a decade, Touch Foundation has strengthened the health system in Tanzania, a nation facing a severe healthcare crisis. When Touch Foundation launched in 2004, Tanzania faced a daunting healthcare environment. Tanzanian life expectancy was declining, infant and under-five child mortality was increasing, and Tanzania’s physician density was among the lowest in the developing world, even when compared to its sub-Saharan African neighbors. Lowell Bryan, a Director Emeritus at McKinsey & Company, founded Touch to address this crisis. His aim was to combine the best of private and public sector approaches and expertise to increase access to essential quality healthcare for those who need it most. Touch has supported the education of over 4,000 healthcare workers, which is approximately 10% of all skilled healthcare workers in the country. We have also strengthened healthcare delivery through investments in infrastructure, equipment, and supplies, enabling healthcare workers to use their knowledge and skills to serve people in need. Since its inception, Touch has relied upon local Tanzanian and key international partnerships. Touch’s work is a continuation of efforts that began in the 1980s by the Catholic Church, which, at the time, delivered nearly 20% of Tanzania’s healthcare. Recognizing the desperate need for more Tanzanian healthcare workers, the Church helped the Tanzanian government establish the country’s fourth medical college, Bugando University College of Health Sciences (later becoming Catholic University of Health and Allied Sciences). To help raise funds for the medical school, Maryknoll priest and physician Fr. Dr. Peter Le Jacq, MM, who had been serving as a medical missionary in Tanzania, began a grassroots fundraising effort in the United States, Touching Tanzania. Through this outreach, Lowell Bryan, a McKinsey & Company Director, became engaged, ultimately founding Touch Foundation in 2004 to expand upon the work already begun. Today Touch relies upon many local and international partners to develop and implement lifesaving programs. When Lowell learned of the new medical school in Mwanza, Tanzania, he supported a team from McKinsey & Company to conduct an in-depth diagnostic of the country’s health system. 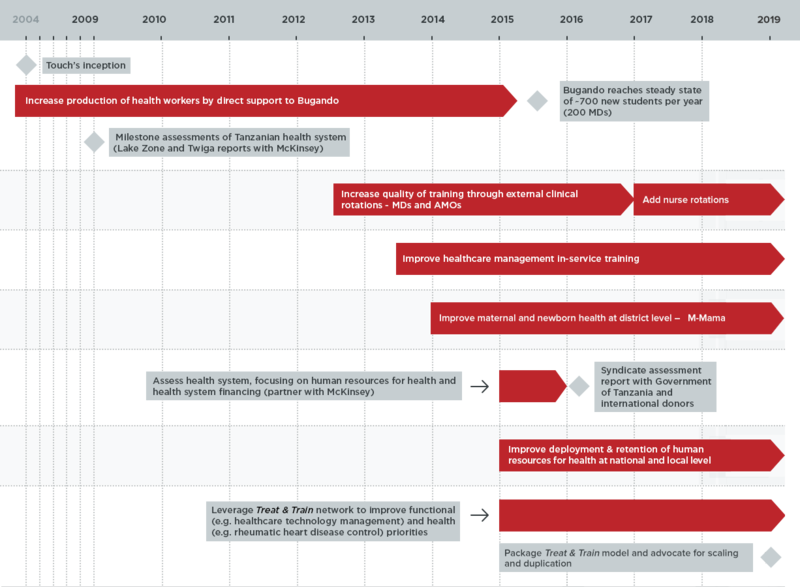 The McKinsey & Company team investigated and concluded that investing in increasing Tanzania’s healthcare workers was an urgent need integral to a national solution to the healthcare crisis. McKinsey & Company’s cornerstone of robust analysis continues to inform Touch’s programs, as we apply a data-driven, evidence-based approach to achieve measurable, enduring impact. Learn more about our support of healthcare worker training. Touch began in 2004 to address the critical shortage of healthcare workers in Tanzania. Since that time, Touch has provided financial support and capacity building to support the growth of Catholic University of Health and Allied Sciences (CUHAS) and Bugando Medical Centre (BMC)—collectively referred to as “Bugando” into leading national institutions. 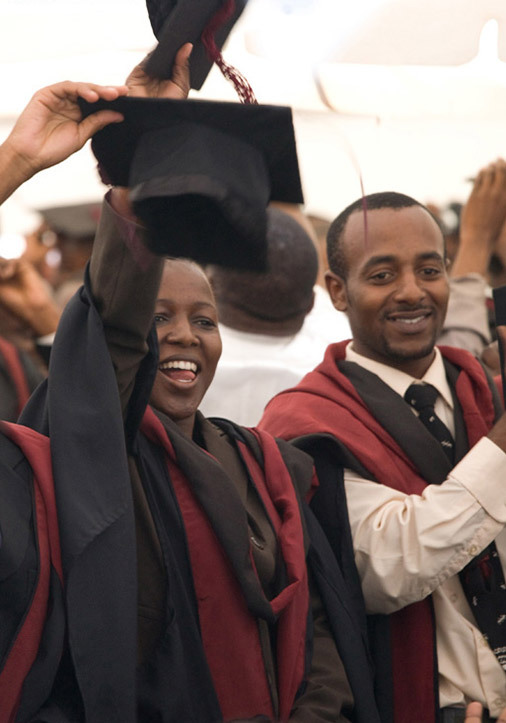 Investments in operational support, including faculty salaries, textbooks, equipment, and supplies have been central to this work, as has the development of critically needed infrastructure. Learn more about our Treat & Train. In 2012, building upon Touch’s work to increase the quantity of healthcare workers, Touch launched a program to improve the quality of healthcare worker training while also providing better care to under-resourced health facilities. What has now developed into Touch’s signature Treat & Train Network began with external rotations that were called Treat & Train. During the final years of a student’s medical studies, rotations familiarize students with different aspects of the clinical environment. As these rotations at BMC became overcrowded, we collaborated with other hospitals to create a network of facilities enabling students to travel to other hospitals for external clinical rotations. Students benefit from hands-on training in smaller class sizes, and they are able to offer patients supervised care at these under-resourced health facilities. Today our programs reflect the interconnected aspects of the health system. 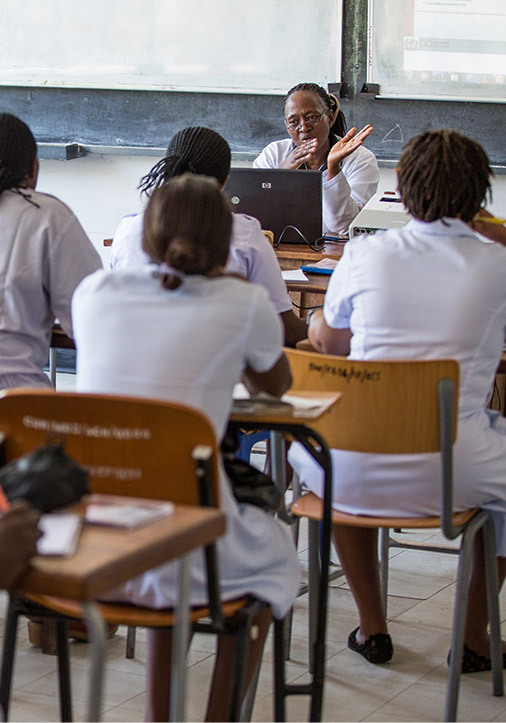 In addition to our ongoing efforts to increase the quantity and quality of healthcare workers in Tanzania, we are developing solutions to ensure the effective deployment and retention of trained graduates throughout the country and addressing specific health priorities. U.S. (mailing address)Touch Foundation, Inc.